Congress says it can’t fund a Zika response, but has found millions of dollars to reward CEO compensation. Few people have heard of Section 162(m) of the tax code. But if you want to understand the deeply perverse incentives built into the American economy, all you need to do is examine this little subsection of the law. Section 162(m) was a well-intentioned effort by Bill Clinton to rein in executive pay by capping tax deductions for CEO salaries at $1 million. There’s a loophole in the language, however, that allows exemptions for stock options or any other pay that is considered “performance-based,” and that loophole has lead to explosive growth in various stock options and bonus payouts for executives—all subsidized by taxpayers. In effect, Section 162(m) created a legal process by which publicly held companies can lower their tax bills by boosting CEO pay, leaving taxpayers on the hook for the lavish salaries of corporate titans. 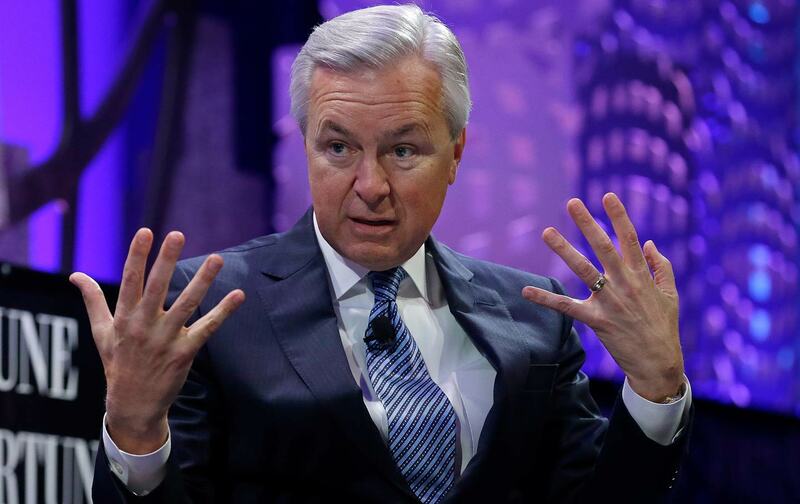 Say, for example, you are Wells Fargo chairman John Stumpf. Between 2012 and 2015, you received $155 million in “performance-based” pay above your actual salary, which is already quite generous. You also saved your company a lot of money by getting paid so much—according to a new study by the Institute for Policy Studies, Wells Fargo was able to claim a $54.2 million tax subsidy in those years based solely on Stumpf’s pay. 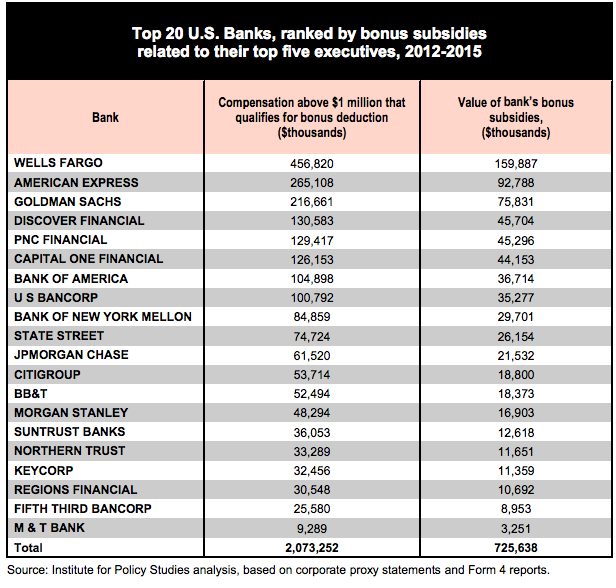 And Stumpf’s $54 million tax break for Wells Fargo was just part of the almost $160 million in taxpayer subsidies the bank was able to claim strictly for executive “performance” compensation. At a time when Congress claims there isn’t even the money to fund an emergency federal response to the outbreak of the Zika virus in the United states, the top 20 Wall Street firms claimed over $725 million in tax benefits since 2012—enough to fund about 70 percent of the Zika package that failed in the Senate earlier this summer. This is a deeply perverse system as it is, but the truly grinding part is that often these “performance-based” bonuses being subsidized by the taxpayer go to CEOs who have demonstrably done a bad job. 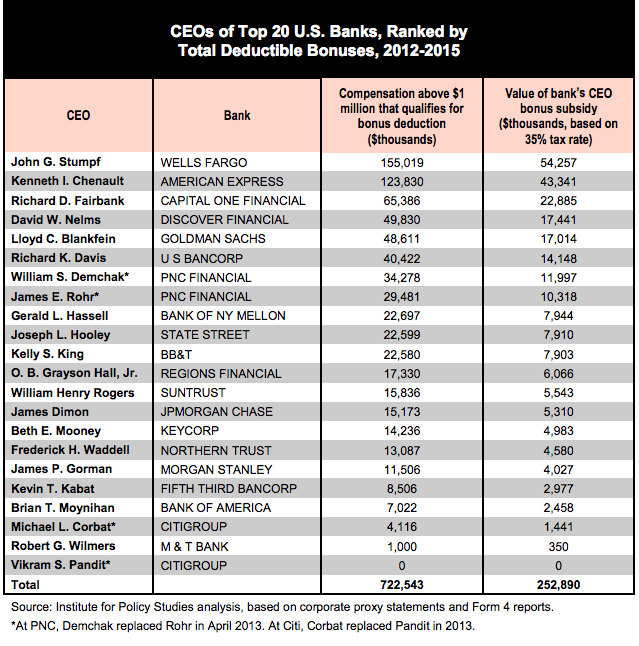 In the case of Stumpf, Wells Fargo’s board paid him a large bonus in 2013 even though the company’s stock price still hadn’t reached pre-2008 levels. As the IPS report notes, the bank also paid $10.4 billion in fines for misconduct between 2012 and 2015, when Stumpf was raking in these bonuses, and was the subject of over 42,000 complaints with the Consumer Financial Protection Bureau. It’s an insane way to run a country—unless of course you’re John Stumpf.